Valentin Stalf quit his job in 2013 in order to set up his own bank. His feel for financial matters is something that he had already developed during his time at the University of St.Gallen, where he studied Business Administration and obtained a Master's degree in Accounting and Finance. 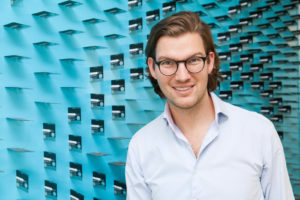 In 2013, he and his partner finally set up Europe's first mobile bank, N26, which reached a million customers last week. N26 has optimized banking for smartphones: simple, fast and in tune with the times. An account can be opened completely on the smartphone in less than eight minutes. Customers can send money to friends and contacts by e-mail or SMS in the same second. By now, Valentin Stalf leads a team of more than 400 employees at N26. The Startup Navigator is not just a theoretic concept. It combines the evidence-based research of the University of St. Gallen with the practical knowledge of leading entrepreneurs such as Valentin Stalf. Valentin had a strong impact on the Startup Navigator and gives the reader consistently tips in topics such as how to get your first customer or developing a solution which solves your problem throughout the book. In the chapter “Solution” of the Startup Navigator, Valentin shares one of his key learnings. According to him, the main reason why startups fail is a simple one: no market need! In order to prevent this, you must think from the market side and not from the personal point of view, otherwise the startup remains small. Get more entrepreneurial insights from Valentin in the Startup Navigator handbook.